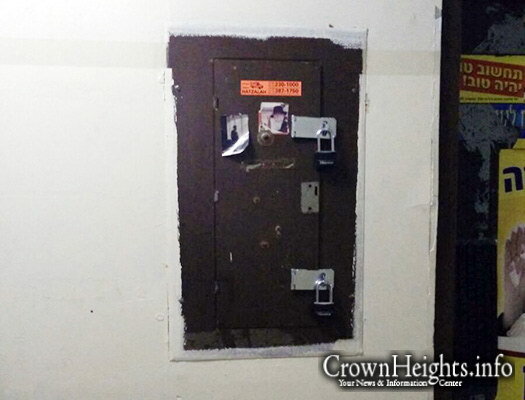 749 remained dark for nearly a week, and around 20 dorm residents – most of whom are not registered yeshiva students – camped out in the downstairs Shul of 770. Late Sunday night, December 20th, at around 2:30am, the lights briefly flickered on in 749. By the next morning, power had been fully restored to the Mikvah, and all the electrical panels in the building had been padlocked with signs stating that the electric was restored and demanding payments of $150 to $350 from each room depending on size. 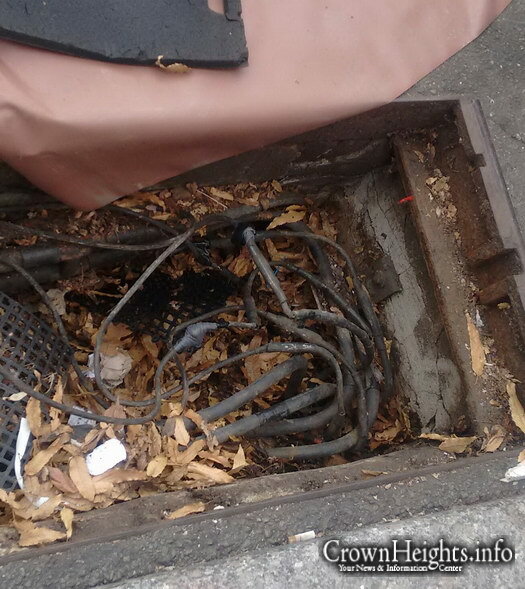 Witnesses said that in the dead of night, at around 2:30am, two cars were placed around the manhole while they worked to illegally reconnect the cut service. On Monday morning, a large Con-Ed crew arrived once again at 749 – presumably in response to reports about the illegally reconnected service – and made the shocking discovery that not only was the electricity reconnected, but that it had been done in an extremely unsafe manner, putting many lives at risk. CrownHeights.info reached out to Con-Ed’s media relations department for comment, but no response was given at time of publication. In 2014, following a fight between building residents and Mendy Hendel over use of the Mikvah, Hendel was ousted as administrator and the Mikvah was repeatedly vandalized. In response, Hendel closed the gas bill with National Grid and the meters were removed. Months later, Hendel was informed that there was still heat and hot water in the Mikvah and reported this to National Grid. Upon inspection, they discovered that the gas was hooked up illegally by circumventing the closed-off pipes. In response, they shut the gas service off at the street level. The Yeshiva then reached out to National Grid, informing them that no one has the right to restore the service without their permission. Nevertheless, Levi Kabakov, a student who was expelled from the Yeshiva some four years ago, went and opened an account in his name, and National Grid restored gas service. 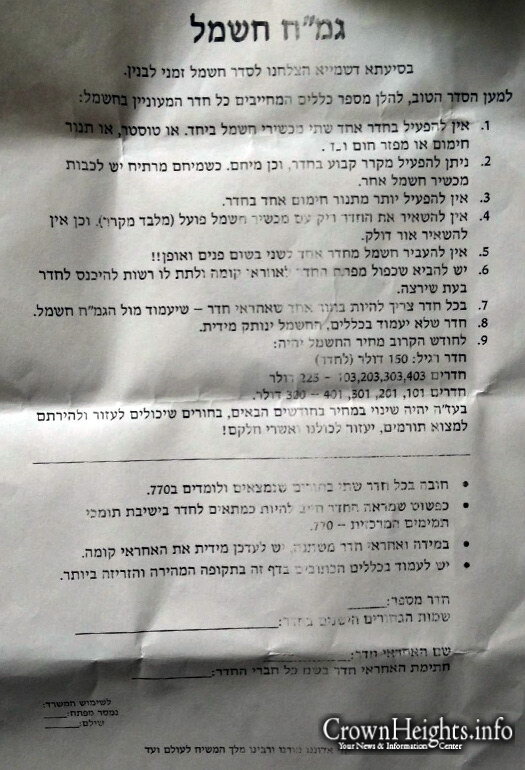 Afterwards, they demanded from the Yeshiva – as the building owners – payment of $9,500 for the illegally obtained gas. 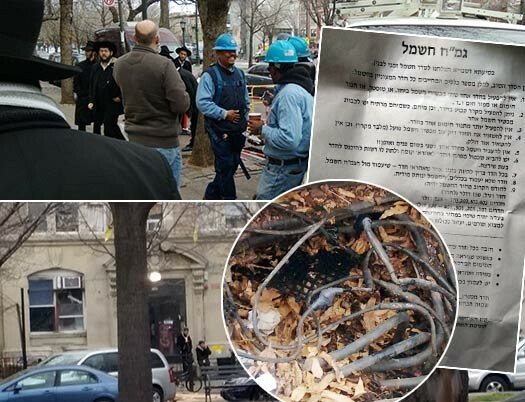 Residents told CrownHeights.info that Kabakov is the one behind the restoration of the electric service, and that they had to pay him for restoring electricity to the individual rooms. Kabakov is also allegedly the one who – until last week – was charging and collecting fees from residents for use of the Mikvah. One of the padlocked electrical panels. Electrical tape used to illegally reconnect the cut wires. Letter demanding money from each room in order to turn on their electric. This entry was posted on December 22, 2015 at 1:40 pm and is filed under Our Glorious Shmira. You can follow any responses to this entry through the RSS 2.0 feed. You can leave a response, or trackback from your own site.